To make a hit in 2014 SUV market, BMW has entered the paradigm with its evolutionary and redesigned BMW X5, which has updated styling, revised powerful engine and improved interior space to make it best among the futuristic SUVs. For those who still appreciate watching first generation BMW X5s on roads, should not forget to consider that those have become quite outdated if compared to the next generation SUVs hitting the market. Taking cue from this only, the German car maker has completely redesigned its 2014 BMW X5 to present the more luxurious SUV which fortunately doesn’t drive like an SUV. 14 models year old in market, BMW still understands what a car lover expects from its luxury SUV and the same they have incorporated in their redesigned BMW X5 keeping a beautiful amalgamation of performance, luxury and utility in mind. Although, BMW claimed that they have kept everything intact which the previous X5 owners have praised, but still they have managed to go a step ahead to make it one of the favorite midsize SUVs. With the 2014 model, you will realize that BMW is stepping carefully in the futuristic SUV section, without making any compromise to their flagship standards. 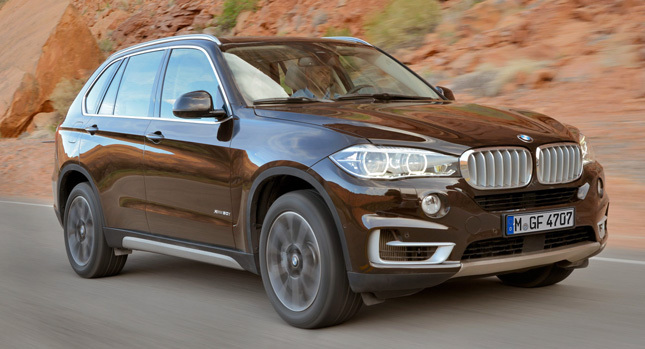 The new 2014 BMW X5 looks more or less the same as it previous model from the outside with the exception of handsome rig which is the only difference one can spot from its previous versions. This time as well, the BMW has maintained the same size and weight while guaranteeing exceptionally capable handling and stability of the X5. Even in the interior section there is not much to boast about, however this time it is more spacious, roomier and classier than its predecessor. They have beautifully split the second row seats in 40/20/40 sections to make them comfortable, thus improving their overall utility and making compromise on their third row seat. Like all their SUV, the 2014 BMW X5 as well can be customized with features depending on your own choice with the addition of designs and themes to make it customized for your needs. Peeping under the hood and we were engulfed by the feeling of déjà vu because the 2014 BMW X5 has kept its turbocharged inline-6 in the 35i trim level unchanged and X5 50is turbocharged V8 is also here without any major modifications with a slight increase in horsepower which now touches 450 hp with better fuel economy. To make the choices more intriguing for their customers, BMW has come up with 35d model and diesel fueled engine to choose from. 255 hp output of diesel engine remains unchanged as well apart from few tweaks and is paired with eight speed automatic transmission that ensures better fuel economy. With midsize SUV market becoming abounded these days, 2014 BMW X5 is not the only ideal choice if we see it from the family hauling point. For this, BMW is facing competition from its own fleet because X3 is a batter option as it’s not that small. Although they have offered third row seats but they are quite small to be even considered if compared to the cheaper SUVs like 2014 Acura MDX and Infiniti QX60. Even in performance department 2014 BMW X5 has its competitors like 2014 Range Rover and 2014 Porsche Cayenne.